As you go through the game, you gain an encyclopedic knowledge of ignorant American sentiments: The French are weak and cowardly; the Germans are ultra-militaristic; the Japanese are sneaky and untrustworthy; the Spanish are flamboyant and vain; Samoans are fat and stupid; Indians skin tigers alive and wear turbans; Russians love their vodka; and black people are ruthless and a bit ignorant. But instead of getting discouraged that a game you loved as a child isn't as politically correct as you once thought, take comfort in the fact that we have come so far. In a mere two decades, videogames have went from stereotyping anything that didn't fit the clean-cut image of Anglo-Saxon America to questioning whether shooting black zombies in Africa is a racist endeavor. But progress has a price. For many years, "racial sensitivity" in the game industry's meant not talking about race at all, or sidestepping the issue through metaphor and symbolism. One example is Oddworld: Abe's Oddysee for the PlayStation One. Abe's Oddysee has two sections: The first had you escape slavery from Rupture Farms by sneaking out of the factory; the second consisted of going back to Rupture Farms to free the other slaves. You don't have to be a genius to figure out the game tried to convey a message about slave labor, or more specifically, slavery in the U.S. during the 1800s. Abe's Oddysee dodged a very difficult issue by portraying the enslavement of cartoon creatures and not real humans. Abe's Oddysee's approach is characteristic of the industry's at large. Whenever there was an opportunity to have a valid discussion about race, their answer has always been the same: Let sleeping dogs lie. But as technology has advanced from one generation to the next, so has the complexity of game narratives. Soon, players were not only asking developers for sharper graphics and more realistic 3-D environments; they were also criticizing games for their story elements and overarching themes. The medium is now at a crossroads: Games can either finally face the issue head on, or continue to dodge the question altogether. And based on the changes Capcom made to Resident Evil 5 after the controvery - a more racially-diverse cast of enemies, an African sidekick - it seems they've chosen the latter. Of course, at the end of the day you're still shooting zombies, regardless of their color. 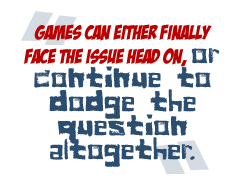 But this brings up a bigger question: Is it OK for games to confront issues that might make some players a little uneasy? If videogames truly are art, isn't it a necessary evil to make some people uncomfortable? For the medium to get more respect from people other than the enthusiast press, it has to finally address race in a way that is mature and responsible without pandering to censors with the band-aid of diversity. Culturally sensitivity is a good thing, but what's the use if we don't actually address the problem at hand? Sumantra Lahiri is a writer by trade and a gamer by leisure. That could be the other way around; no one really knows.